What Do Allergy Air Purifiers Do To Make Them So Valuable? Allergy Air Purifiers: How Do The Work? 1. (Negative Ion Generators) Negative ions are what make up fresh air in nature. Nature’s most powerful air cleansing agent removes allergens and contaminants from the air. Negative ions are found: in mountains, by ocean waves, in meadows, by lightning and at the foot of a waterfall. Negative ion generators produce negative ions which are attracted to positively charged contaminants and allergens. Opposites attract. Because the clumps are too heavy; they fall to the ground. Because houses are shut up and surrounded by asphalt, air is stagnant and void of negative ions. Fresh air contains: 2,000 negative ions per cubic centimeter; houses have 200. Negative ion generators literally put fresh air back into your house. Negative ion generators remove; dust, mold spores, bacteria, soot, animal dander, 2nd hand smoke, pollen, and household odors. Because so much asphalt is present, it interferes with fresh air production around us. 2. Ultraviolet Air Purifiers or UV-C (germicidal lite) work by penetrating cell walls of microbes causing cellular damage. It also breaks the bonds of these organisms. UV-C Light destroys: germs, viruses, bacteria, fungi (mold). Ultraviolet Air Purifiers kill mold in the air. The UV Light of Ultraviolet Air Purifiers has proven effective in disinfecting the air in hospitals for decades. Modern technology makes homes air tight to where fresh air cannot sneak in. Let’s face it; our homes are breeding grounds for viruses, mold, bacteria etc. 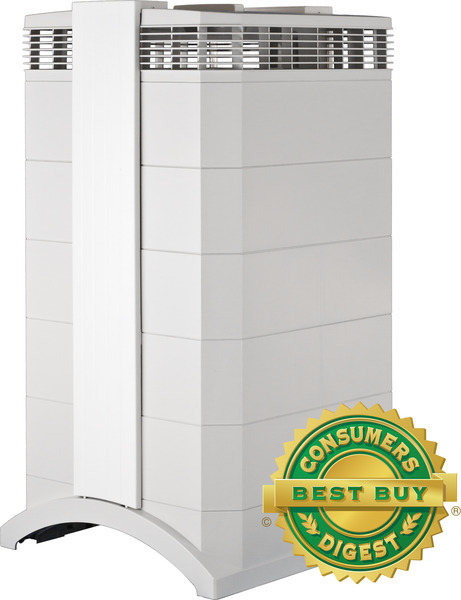 Ultraviolet Air Purifiers are recommended for people with: mold allergies, asthma, allergies and COPD. 3. Electrostatic Air Purifiers (also called Ionizing Purifier) According to John Geisel, E How contributor, electrostatic air purifiers use the “corona discharge” to create an electromagnetic field. Atoms in the air have a neutral charge, they pass through the field and gain an electron and become either positive or negatively charged based on the direction of how the atom passes through the field. The electrostatic air purifier had a series of plates of negative or positive charges, the charged atoms are attracted to the oppositely charged plates. In the air atoms not attracted to plates are attracted to each other and fall to the floor. Electrostatic air purifier neutralizes: mold, viruses, bacteria, pollen, and cigarette smoke. 4. Activated Charcoal Filters: work by being treated with oxygen to open up millions of pores on the surface. Chemicals are attracted, neutralized and are adsorbed on the top of carbon filter. That simply means that the neutralized VOCs and chemicals are bond on the surface of the filter. Review: 1. Negative Ion Generators: produce fresh air by making negative ions. Fresh air has higher levels of negative ions that home air. 2. Ultraviolet Air Purifiers or UV-C (germicidal lite): kills cells thereby killing mold, bacteria, viruses, germs … Used by hospitals to disinfect for decades. 3. Electrostatic Air Purifiers (also called Ionizing Purifier): creates a charge to add an electron to contaminants (mold, viruses, bacteria, pollen, and cigarette smoke) & neutralizes them. 1. Allergy air purifiers are placed throughout the house according to square footage of the rooms. 2. Allergy air purifiers should be placed near people with mold allergies or asthma; especially in bedrooms. 3. It is recommended that allergy air purifiers have HEPA filtration, negative ion generation, and ultraviolet air components in it. Check out our Store as well as the links throughout our articles. Source* http://www.arb.ca.gov/research/indoor/esp_report.pdf Chris Jakober, Ph.D. Candidate Tom Phillips, M.S. I have a few neat blogs as well. Great post and very creative blog you have set up here! Appreciate your comments. Come back again and thanks for your blog also.